One of the most readable novels I’ve read in some time, Gabrielle Kent has crafted a finely woven mash-up of some of the best known children’s literature and created her own excellent adventure. 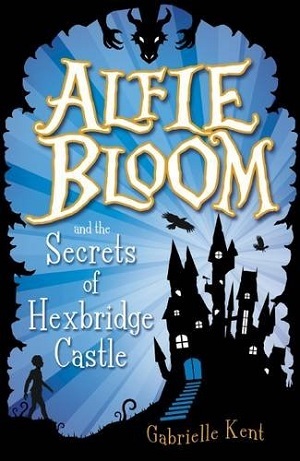 Alfie Bloom, poor and bullied, receives a peculiar summons from an even stranger solicitor and discovers that he has inherited an extraordinary castle. Added to this, he appears to be the custodian of a potent magic, part of which allows him to ‘timeslip’ back hundreds of years. Once living in his castle, he realises that there is a dangerous force roaming the fields, trying to take his magic from him, and he must fight it to save himself and the local village. There are numerous hidden references and allusions in this book to the great children’s writers. The headmistresses of the local school to which Alfie is transferred hail from the realms of Dahl. Named Murkle and Snitch, one short, one tall, yet with Trunchbull-like punishments and glee in issuing them. They are superbly imagined. Alfie’s friendship with his cousins, and their tree house, as well as the sumptuous meals described, hark back to Enid Blyton, and the flying bear rug speaks to many a fantasy author’s imagination – it reminded me of Mary Norton’s bedknob. This was such a captivating read – it flowed so well – and ticked all the boxes of children’s literature – down to descriptions of food wherever possible, an absent parent, a phenomenal Christmas celebration, and a play within the main drama where all is revealed. If I was a child again, I’d hope for at least ten in the series – it would be my mainstay. Gabrielle Kent has really taken all those tropes and reimagined them into a great little book. This start to a new series is fabulously promising. Buy it here. For a capable age seven and over.